Alice Bani, a West Ambae primary school teacher said: "Children are afraid to come to school. When they are at school and hear Manaro making noises they take their backpacks and want to go home. I am so happy that the Just Play Programme has come to help the children of Ambae. The messages they will learn through participation in the programme will help to give them the confidence to return to school." On 9 December the Queen’s Baton arrived to the island of fire, Ambae, Vanuatu where over 600 children from the Just Play Emergency Programme were awaiting its arrival at the base of the volcano, Manaro. The Just Play Emergency Programme, a sport-based emergency response, was launched on the island by the United Nations Children’s Fund (UNICEF), through its partnership with the Oceania Football Confederation (OFC). Leveraging the on-going Just Play programming platform, the emergency programme targeted over 2,000 children who have been affected by the temporary evacuation of Ambae, through Early Childhood Care and Education (ECCE) centres, primary schools and communities. “Ensuring children and families are given the right kind of support and messages to support psychosocial recovery after a major event in their lives is important,” stated UNICEF Vanuatu Field Office Chief, Andrew Parker. “Parents can start focussing on rebuilding their lives once they can see their children happy and playing – and we can do this through sports”, he added. Recognising the important role sport can play in supporting the psychosocial recovery of children after an emergency, the Just Play Emergency programme, supported the dissemination of critical messages through play-based sessions and festivals. Kicking off celebrations for the 2018 Commonwealth Games on the Gold Cost, the Queen’s Baton is touring the Commonwealth. On its epic journey to the Gold Cost, the baton will cover over 200,000 km in less than 400 days – making its debut in Vanuatu on the East and West of Ambae at the Just Play Emergency Programme festivals. The baton leverages the power of sport, bringing people together as it is passed hand, to hand, reinforcing inspiring messages of hope, recovery and perseverance for the children of Ambae. The Just Play Emergency Programme was delivered in partnership with the Vanuatu Football Federation, the Fiji Football Association, the Union of European Football Association (UEFA) and the UEFA Foundation for Children, Vanuatu Association of Sport and National Olympic Committee (VASANOC) and the Government of Vanuatu. 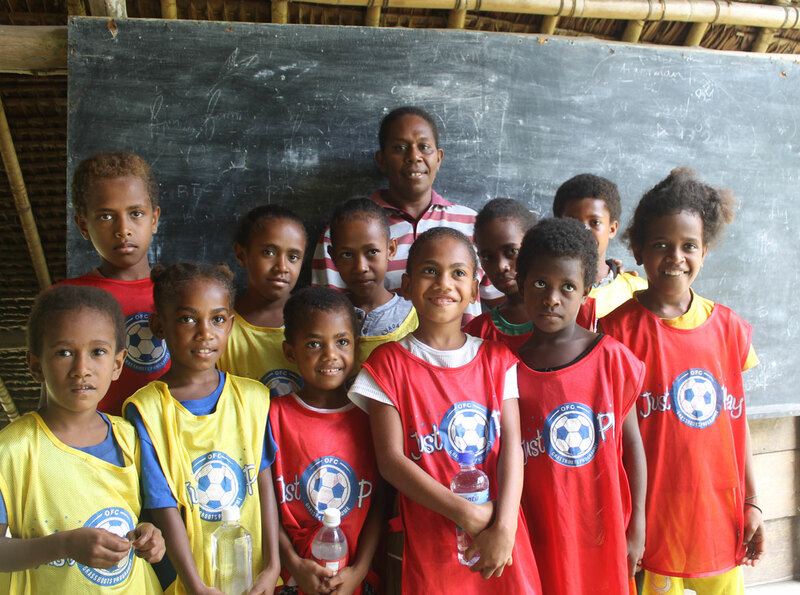 OFC is charged with the task of servicing and administering football in the Oceania region while also using the game as a tool for social development. The Confederation is led by OFC President David Chung who was elected to office in 2011. Established in 2015, the UEFA Foundation for Children is a charitable organisation governed by Swiss law. It defends the rights of underprivileged children by using the power of football to improve their lives and to help them develop their potential and find their place in the community. The foundation currently invests in 107 projects in 81 countries worldwide. More than 700,000 children have already benefited from the foundation’s work since its creation.